My high school was like a bootcamp for entrepreneurs. 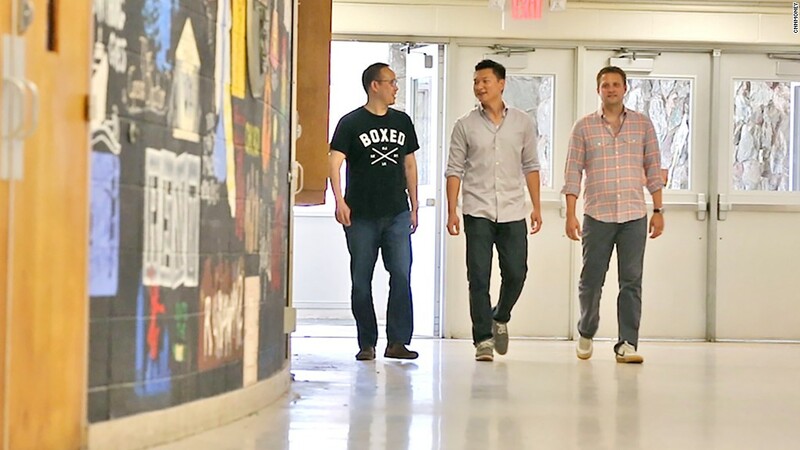 Chieh Huang, Matt Salzberg, and Ken Chen graduated just a few years before me. They're the co-founders of Boxed, Blue Apron, and Nature Box -- three startups with a combined valuation of more than $2 billion. This wasn't a prep school, and it wasn't in the Valley. We grew up in central New Jersey. We went to J.P. Stevens, a public high school in Edison. In many ways, J.P. was built to be a startup incubator. Our mission statement was, and still is, "Nothing less than excellence." Social hierarchy was based (in part) on the number of AP classes you took, your SAT score, and how many extracurricular activities you were in -- with one unspoken rule: Participation in clubs didn't count unless you were president or on the executive board. By those standards, all three startup founders were at the top of their class in some way or another. Chieh, who was in the class of 1999, was voted to homecoming court and in the National Honors Society. Matt was valedictorian of his class in 2001, president of Future Business Leaders of America and several other clubs, and part of the tennis team. Ken played basketball and was student council president. He and Matt graduated together. But despite its competitive atmosphere, J.P. was also a very collaborative place. Teachers readily assigned group projects. Studying often turned into sleepovers. And then there was the plethora of after-school clubs. "That's your first time to really experiment with managing people, managing a business," Matt said. "You can learn to drive projects forward. You can learn to manage other people. There's really no risk to failure in doing that in high school. It's a really good opportunity for students to do that and I recommend everyone does." Edison is a 45-minute southwest train ride from Manhattan. It appears to be a normal suburb -- boasting dozens of diners, three nearby malls, and countless Dunkin' Donuts -- but it's unusually diverse. J.P. was about 45% Asian at the time we went to school -- a combination of East Asian and South Asian families. Many were recent immigrants. Ken and Chieh were both born abroad. Ken said his parents gave up everything to move to the states. The only thing he wanted to do in return was maximize the opportunity he was given. He felt he could make the biggest impact by starting a business. "We live in a society where someone like me, a minority with only 10 years of work experience, can start a company of this size," said Ken, who co-founded Nature Box in 2012. Timing also helped, Chieh acknowledged. "When we were in high school, the Internet was starting to explode," Chieh said. "I can't help but think that we're just a function of the time we grew up in." What's amazing about these three entrepreneurs is how similar their careers tracks have been. They all graduated from the same high school. They all chose the same, difficult business model -- e-commerce. They launched their businesses around the same time. And they all want to change the way people buy groceries and eat. Chieh sold his first startup to Zynga (ZNGA) in 2011. He launched and became CEO of Boxed, an online version of Costco (COST) without the membership fee, in 2013. In 2012, Matt helped start Blue Apron -- a service that delivers fully prepped recipes to subscribers -- and is now the company's CEO. That same year, Ken co-founded Nature Box, a company that creates and ships custom combinations of healthy snacks. "It's impressive. Really impressive," said Jeff Richards, managing partner at GGV Capital, a venture fund and an investor in Boxed. Food and groceries are hard markets to go into because there are so many aspects of the business that isn't digital, he added. There's logistics, supply chain, sales, physical warehouses, and perishable products, on top of everything else a startup has to worry about. "They're tackling a very hard category," said Richards. "A lot of entrepreneurs would have gone after something easier." All three alums laughed and commiserated on the challenges of their businesses, but said they wouldn't want it any other way. "Of course you could do something that's been done before, and you could do something that's really easy, but there's not as much upside to doing that," Matt said. "If you really want to make an impact, you really want to transform people's lives...you have to do something that other people can't do." Of the three startups, Blue Apron has raised the most amount of money to date -- $193 million, according to PrivCo. The company is valued at $2 billion. Boxed and Nature Box have raised more than $91 million altogether, and investors say they're worth several hundred million dollars. Gail Pawlikowski, J.P. Stevens' principal, said she's thrilled to learn about her school's alum. "They're just dedicated. They work hard," she said. "They're certainly great role models."